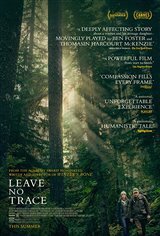 Will (Ben Foster) and his 13-year-old daughter, Tom (Thomasin Harcourt McKenzie), live an idyllic existence in the woods of Portland, Oregon. When they are noticed by the authorities, they're taken into custody and Will's parenting is questioned. However, it soon becomes clear that Tom is well educated by her father and that other than the fact that they were living in a national park, they have broken no laws. They're given a trailer home to live in and Tom is sent to school, while Will, a military vet with PTSD, is put to work planting trees, but he's unhappy with this new existence. Tom enjoys going to school and doesn't have any trouble adapting, so when Will tells Tom to pack her things, she resists.